In the 1990 "hit" The Forbidden Dance, a princess emerges from the Amazon in an effort to fight a multi-national conglomerate threatening her people's land and forests. She makes her way to L.A. the land of broken dreams and high heels in an effort to save the day. Huge mistake lady. Anyways, she mixes it up with some guy and we all learn a valuable lesson; "there's only one dance that can turn feeling into rhythm, strangers into lovers and passion into fury. 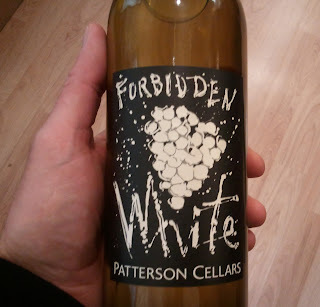 The Lambada, The Forbidden Dance..."
The Forbidden White from Patterson Cellars is basically the same thing, except for the whole Amazon to L.A. and passion into fury thing. I mean let's be honest, you and a stranger drink a whole bottle of wine together, there's no telling what can happen, maybe you do end up lovers. The Forbidden White is a nice bottle to share with a stranger for a couple of reasons. It hits a couple different high notes on the way to a really well made, bright crisp and fun wine. The varietal blending is if anything unique, barrel fermented Chardonnay (56%) Viognier which was subject to extended exposure to the lees (32%) and at this point with the combination of barrel fermentation and sur lie Viognier you might expect a really rounded almost buttery wine, au contraire. This wine is all kinds of fruit forward, though the varying fermentation combinations give it a beautifully full mouthfeel. In comes the Siegerrebe (12%) grown over on this side of the Cascades in the Comfort Vineyard on Whidbey Island. The result is a unique white wine blend that hits many geographic points on the map of Washington and provides dizzying fruit and floral aromatics. The wine is not an acid bomb but rather a complex white wine that can be sipped all into the evening without food. Much like the Forbidden Dance it will awaken your furious passion for white wines from Washington. The label is a bit of a mystery and while I'm not necessarily a fan it's apparently a Chihuly piece. The wine is carried by Vinum and so if you're not seeing it in your favorite local wine shop, ask your steward. You won't regret looking past the label at a fantastic wine at $16-18 it's a great find. If you do decide to go all Lambada and drink this wine with a stranger, be safe, use protection.